For Prospect.4: The Lotus in Spite of the Swamp, the fourth iteration of New Orleans’ citywide exhibition, Akunyili Crosby will show new and existing works that continue her investigation into nuances of post-colonial identity. In her large-scale works on paper art historical, political and personal references are combined to make luminous, densely layered figurative compositions whose intricate surfaces are a marriage of disparate materials and aesthetic traditions. 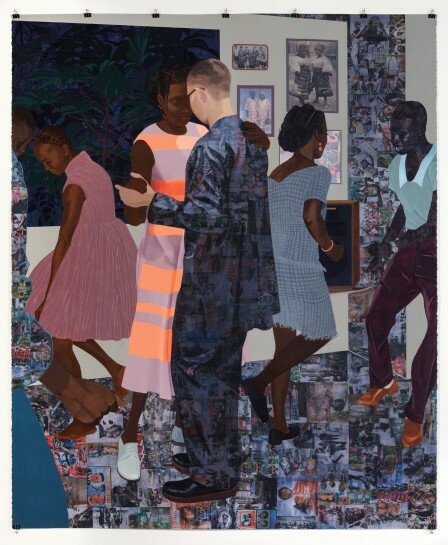 Through these, Akunyili Crosby addresses the idea of cultural overlap and the complex layering of influences – personal, cultural and political – on people and places. The triennial’s roster features 73 artists from the United States, Latin America and the Caribbean, as well as Africa, Europe and Asia. More than 30 of them will create works specifically for the exhibition, which is spread around 17 venues.